Several people have mentioned to me that this generation is different because it has no vision of the future. The 1950s had their future houses. The 1960s had The Jetsons and Andre Courregas. The 1970s had, well, Star Wars. Skipping forward a few years, people these days don’t have the same chrome conceptions as of old, but even with widespread computers, nothing has really replaced that conception either. Are we living in a void? Staring into the abyss? So what do we think? I present one literal and one figurative interpretation. Or if you can’t find a trash can to vomit, use your foot. This spongy barf-looking shoe is the footwear of the future. I’m not joking. Shamees Aden, a London-based designer and researcher, has created a new type of shoe that will not only respond to your every move but will have the power to regenerate itself overnight when you stick it in a jar of magic goo. The real secret here is that the shoe is made out of photocells, which, I believe, means that you will be able to make them yourself from 3D printers (in the midst of the articles I read about them I am not sure if these two facts are wholly dependent or not). Unfortunately, these are still in the conceptual stage, so it will probably be four decades until they hit the shelves. Maybe they can work out a reboot of their image in the meantime, though that would result in leaving the generation still future-less. 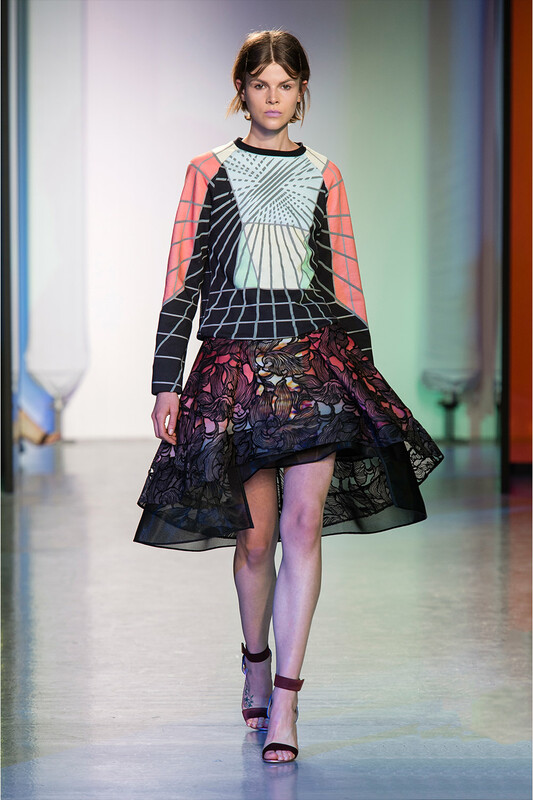 Peter Pilotto presents a hypothetical in answer. The more we can do with computers, the more graphics driven our fashion will become. In his recent Spring/ Summer 2014 collection, Peter Politto produced the prototype of this future fashion, showcasing my hypothesis. All photos and further information are available here. What does your vision of the future hold? Do you disagree altogether and think that this generation has a clear adopted view? Let me know and Happy New Years! Sarah Burton’s Spring 2014 collection for Alexander McQueen introduced something to put on your head. But what is it? Hat? Cap? Cloche? Skullcap? Flashing down the runway in silver and gold, where did this innovation come from? “I wanted energy without froth.” Burton claims. I posit 3 possible inspirations. 1. Blue collar power tool industry inspiration? This seems like the most likely option to me based on last year’s beekeeping theme. Is Burton/ McQueen quietly paying homage to different industries, making statements about there perception while transfusing high and low cultural conceptions? 2. A modern take on a 1920s cloche? Is this update supposed to be an interpretation of a “new woman” and the more metallic streamlined look supposed to represent strength? Burton agreed with this interpretation saying, “They’re sort of 1920s cloche hats.” While this may be true, contrasted with the tribal and militaristic influences of the collection, what started as a cloche seems like decidedly something else. 3. (my personal favorite) Tron? Have any better ideas? Let me know what you think… Feel free to add whether you would ever wear this. I’m still on the fence.